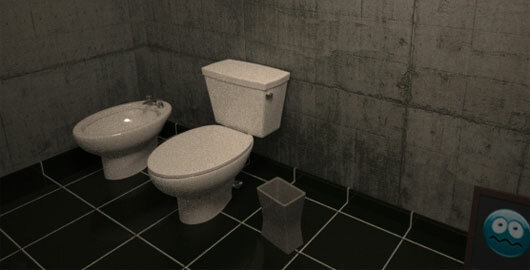 Escape 3D: The Bathroom is a Room Escape game from Alberto Braga where you wake up in a bathroom with no memory. The door has been locked and you are trapped in the bathroom. Find a way to get out of here! Click con the red carpet. Get the key. Click on the silver box. Get it. Use the key on top one. Get the gun magazine. Click on the middle one. Get the handle. Click on the curtains to open it. Click on the top of the shower. Get red wire. Click on the bottom of the shower. Get duck. Click on the bidet. Get the plug. Click on the bin. Get the smudged paper. Get the hammer head back of the water cup. Combine it with the handle. Use the plug on the sink. Open the water and put some soap. Use the smudged paper on the water. Go right twice. Zoom on the water cup. Put the duck on it. Go back. Turn on the tank. Zoom in. Get the other smudged paper. Combine with the other. Take of the picture. Use the red wire on the green one. Use the smudged paper on the security box. Open it. Use the hammer on the box. Get the bullets. Combine with the magazine. Combine the loaded magazine with the gun. water cup=toilet? I’ve never heard that one. Also, shooting your way out of the bathroom? Not the safest. I hope I tried knocking and calling out first…. does anyone manage to open the locked cabinet on the left side of mirror? or is it just red herring? In real life you would take the hammer and smash the lock but that little of logic doesn’t fit in most developer’s brain nowadays. In my case, Im not able to take the hammer handle an neither the red carpet. Is it buggy? restartet it and it is the same, nobody else with this problem? Posted on Tuesday, March 8th, 2011. Follow any responses through the RSS 2.0 feed.